being one of the hottest tourist destinations in europe and 'clooney effect' aside, Lake Como is also a summertime playground for the Milanese, a quick train ride away out of the bustling city. arriving to the city of Como from Milan I was greeted by medieval historical architecture, charming piazzas, open-air markets and gelato glee on every corner. there was definitely more happening in this lakeside capital, as it was far more cosmopolitan than anticipated. 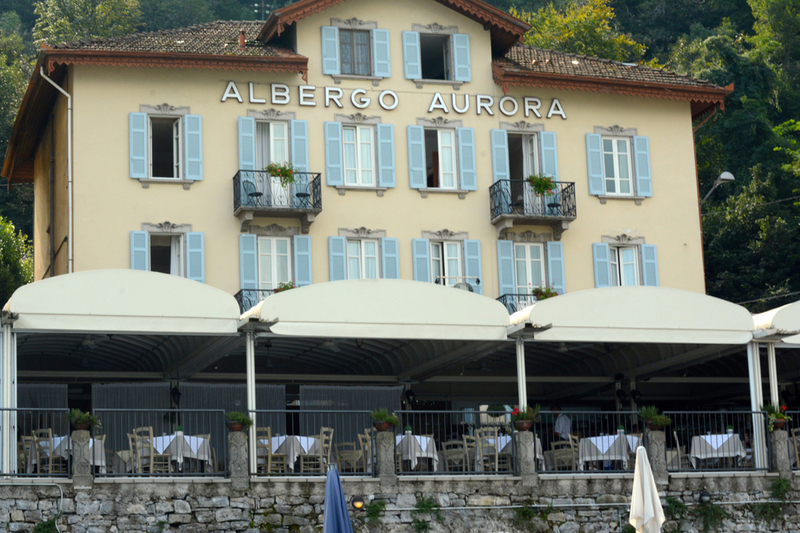 With a backdrop of the vast lake, the city of como is an excellent introduction to the province, although i was far more anxious to explore the suspected laid-back villages peppered around the shoreline. after strolling the streets, I was overwhelmed by the masses to catch the ferries out to the satellite villages and definitely a bit skeptical about what I got us into. most of the high-speed ferries are hydofoil and designed to hold hundreds of passengers and gratefully they have large windows for scenic photos. a hydrofoil is a very smooth ride and interesting concept, as the hull is propelled out of the water and the vessel becomes a wing-like structure, floating across the top of the water at higher speeds. admittedly i was quite impressed by the ferry system and how efficiently the captain and crew dock the boats in a matter of seconds, although i felt like i was inside of a tourist trap. the upside to the amount of people initially i found was if you choose the right village to stay in, the feeling of exclusivity will follow. the ferry dropped us at our first destination, the village of Lezzeno, and rest assured we were the only two to hop off. another surprise was the large amount of luggage on the ferries. we are all tourists after all, although there is a difference in a good, bad and ugly tourist. it's not an airline where your luggage disappears for a few hours, although similar space-wise as the seats on the boats are tight. you board with your luggage, so wisely try to pack light and even go carry-on as it will make the trip easier with hopping on the train and then a ferry to finally get to your destination if you are heading to the outer villages. all in all if you are able to patiently get through the arrival experience and off to your hotel or villa, you will discover the peace of this beautiful lake. another option is also to rent a car versus using the ferry system. it's a bit daunting choosing where to stay as the lake is truly enormous, stretching over 100 miles in length. looking at the map below, the lake is shaped in an inverted 'Y' and the villages are all easily interconnected by ferry. bellagio is the most touristed hands down, next to tremezzo and menaggio. i chose first to stay in lezzeno and then varenna, still located in the middle lake and easily accessible to the other towns. i was searching for a more private, quaint and authentic experience versus a large luxury hotel for this occasion, so i perused airbnb.com for the first time in hopes of luxury-boutique, and i found it in lezzeno. reasonably priced we were able to reserve a lakefront suite at villa aurora with expansive views nestled directly across from the island of comicina, the locale of villa de richard branson. our suite had lovely french doors that opened over the water's edge and had every touch of a luxury hotel, including nice amenities, a rain shower, plush linens, and a fresh breakfast each morning. owner margherita made our stay very special and beyond welcoming. following our visit in lezzeno, we hopped to the fishing village of varenna, which features a waterfront cafe culture, historical narrow cobblestone walkways and bright colorful homes that hug the shoreline. we stayed at villa cipressi, a stunning collection of buildings rich in history encompassing a swoon-worthy botanical garden that has an inviting lakefront terrace and gourmet restaurant. after i had solidified spots to stay that were more off the beaten path, we wanted to tour around and see many of the hotspots, extravagant villas, boutiques and restaurants. bellagio is the village that has the highest daily influx of trippers so we went to check out what all the hype was about. it was on our list to do a bit of shopping, pop into a scarf store and spend a delicious afternoon lingering and slurping handmade pasta. como is italy's capital of silk so we bought 'his and hers' silk scarves from azalea, which carries big name brands such as missoni and versace. many of the restaurants offered a lake view, and were pretty packed, so we discovered a backwater restaurant frequented by the boss himself, bruce springsteen. naturally afterwards we found a cone full of creamy, cold gelato and pressed the pause button, as there is something about those licks on the steps of italy that keep you forever young. Bellagio offers elegant spots to find a bite, although strategically geared towards tourist clientele. The other villages had more local eateries, and if one dish says lake como, it's lavarello or lake fish, a must try. lastly, my favorite surprise was the convenient ability to rent a private boat and see everything lake como has to offer from her bonafide body of water. you do not even need a license, only bubbly. we knew we did not have enough time to see every villa and garden, so this by far was our favorite because as mentioned above the ferries are typically crowded. i mean whose husband is willing to take you firsthand to george and richard's villas! the rental boats are offered through various hotels and villas, and the price tag is not bad, around 60-70 euro. "be a traveler, not a tourist. try new things, meet new people and look beyond what's right in front of you. those are the keys to understanding this amazing world we live in."